VIERO - Uomo del Brasile. / Homme du Brasil. VIERO, Theodorum. - Uomo del Brasile. / Homme du Brasil. Uomo del Brasile. / Homme du Brasil. - VIERO, Theodorum. Title : Uomo del Brasile. / Homme du Brasil..
Map maker : VIERO, Theodorum.. Date : Venice, Antonio Zatta, c.1790. Size : 10.0 x 6.7 inches. / 25.5 x 17.0 cm. 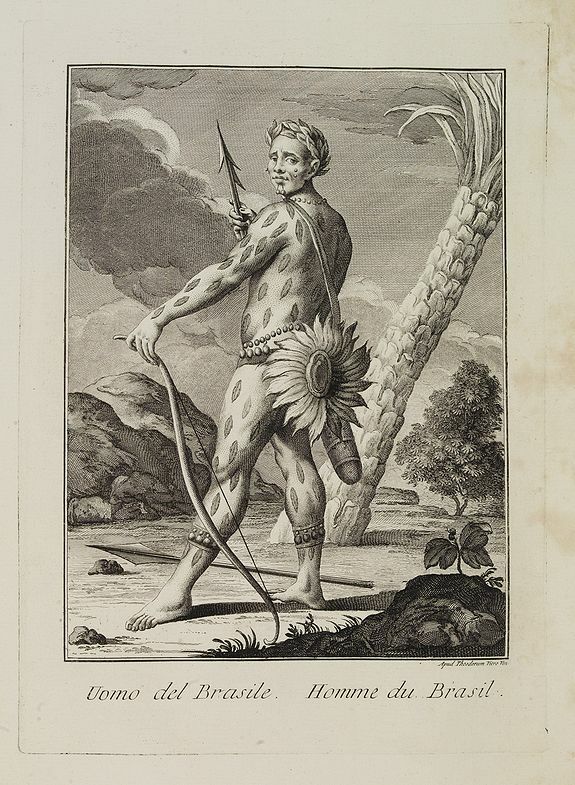 Description :Full portrait of a Brazilian hunter. From "Raccolta di ? stampe." a series of historically significant eighteenth-century copper plate engravings by Venetian engraver Theodoro Viero (1740-1819). Dating from 1783-90, the engraved print on laid paper is titled in both Italian and French, the series included peoples of Central Asia, Asia , Europe, Russia, North Africa, and more distant locations including Peru and the newly-mapped Pacific. Born in Bassano, Italy, Theodoro Viero studied under Venetian engraver Niccolò Cavalli, before settling in Venice and establishing his business as a miniaturist, burin engraver and print publisher. While publishing a large number of plates by other printmakers, his own output included reproductions of works by Venetian masters including Canaletto, Tiepolo and Giovanni Battista Piazzetta. . Produced during the last days of the 1100-year-old independent Venetian Republic (before being conquered by Napoleon in 1797), the presence in this folio of images of the Doge and Dogaressa suggests that "Raccolta di ? stampe" was at least a partial tribute to Venice's rulers, at that time still living symbols of Venetian power and wealth, their palazzo filled with treasures from the farthest corners of the globe. Condition : With some foxing in the right margin. Good impression. Else good condition.